By: Sphar Thomas Burklow, Sr. I am Sphar Thomas Burklow, Sr. and am writing the following autobiography so that my children will know their father a little better. I realized after I grew older that I would have liked to have known more about the personal lives of my parents. I loved them and they loved me. I was just too dumb to learn about them until it was too late. They are gone my life is less complete because I didn’t know more about them. So, …… the following events, consisting of high adventures and mysteries, are for my children and grandchildren. (Most of what you will be reading concerning birth through 5 years of age was told to me later in life, so there may be a few errors due to defective recall). The two responsible for my entrance onto the stage of life were Lillian Glenmore Brunner (Burklow), and Duke Harrison Burklow. 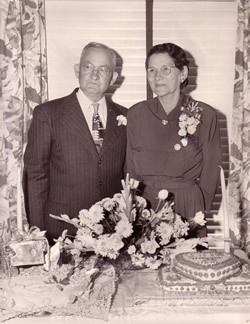 Lillian and Duke were living in Wheelwright Kentucky at the time of their first pregnancy. Lillian was a housewife and Duke was the manager of the No. Two Company Store, in Wheelwright. 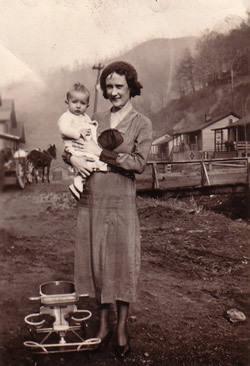 Wheelwright is a coal town located in Floyd County, in eastern Kentucky. This small town is nesteled in a narrow valley between foothills about as tall as those near Gatlinburg, Tennessee. I don’t know of any famous person or special event associated with Wheelwright, it was just an average coal mining town with average people. Wheelwright was owned by the Inland Steel Company and was a real company town, with company housing, company stores, and even company produced metal coins called “script”. (Workers would borrow against their next paycheck. This borrowed money was a loan to the worker in the form of script. If a worker borrowed too much he really would, “owe his soul to the company store” as in a song made famous by Tennessee Ernie Ford titled, “Fourteen Tons”.). Duke and Lillian decided to go to Neon, Kentucky for this life changing event. No one asked me how I felt about Neon, Kentucky but that happens to you a lot when you have not been born yet. I think Duke went to Neon because Lillian wanted to go to Neon. Lillian probably chose Neon because her parents lived there and also the doctor was sober. I am not referring to Duke and Lillian as dad and mom yet, because at this time I haven’t been born! These two people are just your normal everyday nervous wrecks, having mixed thoughts about becoming parents. Lillian’s parents, Sphar and Patsy Brunner, Lived in a modest little house located in Hogg Hollow (pronounced, “Hog Hollar”). One could get to this house be either walking or driving up a creek bed if the water wasn’t too deep, or the rocks weren’t too slippery. 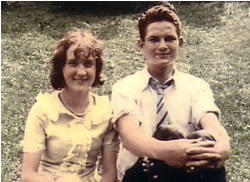 Duke’s parents were James Thomas Burklow and Maggie Young (Burklow) and they lived in Fleming, Kentucky. Fleming was a coal mining town just a mile or so from Neon. During Lillian’s labor Duke, on several occasions, would leave the room muttering words of encouragement such as, “what have I done?.... Never going to do this again!”. Lillian’s mother was very sympathetic on these occasions. She would tell Duke, in her new mother-in-law tone of voice, “This is all your fault….. Get back in that room and stay there until the baby comes!”. Poor Duke and Lillian, both of them hurting but for different reasons. These two fine people were about to have their lifestyle changed beyond belief. 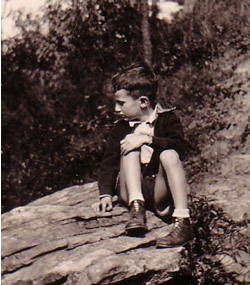 April 24, 1931, a great day in my life… I was born! I think I was born about 4 o’clock AM, but since I was so young this is basically a wild guess. I am told I was a hard delivery and after entering this world my head shaped like a football (Patriarch of the cone-head dynasty). I must have looked pretty bad because a blanket was placed over my head in such a way as to hide the shape of my head. I got even with my parents for taking me out of a nice warm womb. I had colic for about six months! I think that I must have been a lot of trouble during the first year. It is quite possible that mom and dad were considering limiting the size of their family to ONE CHILD. I am really glad that they recovered from the shock that their first born must have caused. I was the first of five children (plus one miscarriage). I realized later in life that I was part of a very loving family. I have always appreciated this family because it was always there for me. Don’t get me wrong, we had all of the fights, spats, and fun that any normal family has during that time when children are growing up. The railroad tracks came straight out of Wheelwright, starting at the assembly yard near the main part of town. The assembly yard was where the coal-filled railroad cars were gathered prior to being pulled out by a steam engine. The road for automobiles ran parallel to the railroad tracks three times after it left the main part of town. The store that my father managed (referred to hereafter as the No. 2 store) was located where the automobile road crossed the railroad tracks the second time. The house, that I remember, was a two-story house located diagonally across the railroad tracks from No. 2 store (No. 1 store was located in the main part of town) and was the last house in that row of houses. There was also a small creek that flowed out of Wheelwright right behind my house. You talk about a playground made for a kid… mountains, creek, mud, dirt, trees, slate dumps, railroad tracks, and lots of play time! I was going to have to play 24 hours a day to use all this equipment, it was a dirty job but I was just the kid that would love every minute of it! If you were facing the front of the house you would see two stories; first floor left side was a living room, immediately above this room was a bedroom the same size and shape as the living room, to the right of the living room was another bedroom, immediately above this room was a bedroom the same size and shape as the one below it. There was a door leading from the end of the living room adjacent to the downstairs bedroom outside to the front porch. This porch with banisters ran the length of the house and had a swing on the left end. Behind the living room was the dining room, behind the dining room was the bathroom (added later when I was about five years old). Separating the living room and the dining room was a staircase and landing. Adjacent to the dining room and behind the downstairs bedroom was the kitchen. Behind the kitchen and adjacent to the bathroom was a small back porch. The front porch was about one foot above ground level and about 20 feet from the railroad tracks. The back porch was about eight feet above ground level and about ten feet from the creek. I have described this house from loving memories, and as you can see it is a house made for a kid! I could run out of the front door to the railroad track where an inexhaustible supply of small round rocks (railroad beds were constructed from creek gravel) was available for throwing or use as ammunition for slingshots. I could run out of the back door and jump into the creek. If mom was really after me, I could run around in circles, from room to room, inside the house until I was exhausted. I never ran upstairs because that was the only place where she could corner me!